Apple decided to go with the same screen as the previous iPhone - which is to say, one of the best screens on the market. The one thing that could have improved it was if Apple bumped up the size, a move that many expected (even hoped for) but didn’t come. On the up side, the iPhone experience remains unchanged - in how the UI and apps look, how it fits in your hand and pocket, the compatibility with most accessories. Speaking of which, we know of one accessory that is no longer needed - the bumper (you can still use one, but for purely aesthetic reasons). Apple learned its lesson from the iPhone 4 and while the iPhone 4S looks practically the same, it features two antennas to combat the "death grip" issue. Note that we're not talking about one GSM and one CDMA antenna - yes, the 4S is a dual-mode device that supports both networks, but it features two separate antennas that are connected to both radios. The phone can intelligently switch between the two antennas as needed (even in the middle of a call), so if one antenna is blocked, the other takes over. This means no death grip, no matter how you hold the iPhone 4. This will improve reception in areas of spotty coverage, where even the slightest sign of death grip can push reception below the threshold needed to make a call. Whether it will improve reception while not holding the phone at all is another question that will take a while to answer - but user reports have been positive for now. Incompatibilities with accessories stem from the slightly offset mute button. Now the CDMA iPhone 4 has had this design change from day one, so if you are on Verizon US, your bumpers will probably fit quite all. Clever antenna design aside, the internals of the iPhone 4S were updated too. The Apple A5 chipset features a dual-core processor with PowerVR SGX543MP2 graphics that promise a 7x increase in rendering power. It's basically the same setup found in the iPad 2. We'll be testing performance later on. One thing that didn’t change from the iPhone 4 is the amount of RAM - it's 512MB again. We haven't seen iOS having any RAM issues, so we don't think this will be a big deal. The dual-core CPU launches apps tangibly faster, though it's not that big of an improvement. . The battery in the iPhone 4S has virtually the same capacity as the one in the iPhone 4 save for a few mAh. We're working on a battery test, but that will take a while to complete. The iPhone 4S camera comes with a wider f/2.4 lens aperture, which will let more light in for its 8MP camera. The sensor design has changed too, both of which should offer improved low-light performance - we'll investigate how much a little later. Two last changes - the iPhone 4S is available in white from the get go and there is a 64GB version. We don't think Apple will ever let a memory card get inside their iPhones, but 64GB is about the maximum most phones can offer, even with rare (and pricy) 64GB microSDXC cards. But they do charge a premium for that sort of storage. As you've undoubtedly heard (and seen) Siri, the personal digital assistant that lives in the iPhone 4S, is really amazing. It listens to your spoken questions and answers back in its own voice. It's very flexible and you can ask it for information (weather, stocks, points of interest, you name it) and also ask it to perform tasks for you - set an alarm, add a calendar entry, compose a message, put down a note. Apple even gave it a bit of an attitude, so when you ask it something silly (as you surely will, just for the fun of it), Siri comes back with a clever answer and a grin on its face. The practical value of such jokes is zero, but it really gives the user a sense that they are speaking to something intelligent rather than something that knows some answers by rote. You should keep in mind that Siri loses a good deal of its usability outside the US as it can't search for nearby points of interests and businesses. It also supports a limited number of languages and if you think your English will cut it, you may be wrong as Siri is very bad with accents. 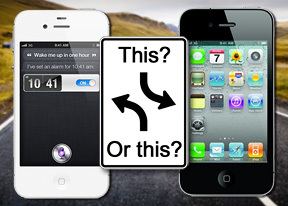 Here's the bad news for iPhone 4 owners - Siri is not for you, just for the new iPhone 4S. Now, Apple says the service is in beta, so there's a chance that Siri will come to the iPhone 4 with an update somewhere down the line. But that's not a given and even if it does happen, you'll have to wait for it. If you want the futuristic convenience that Siri offers now, you'll need an iPhone 4S. Well, not quite. You can grab a free third party solution (e.g. Vlingo), which covers some of the same functionality and run it on your iPhone 4. Such solutions are not nearly as extensive or as flexible as Siri is, but do give them a try to see if they can be used as a stopgap measure. The dual-core CPU in the Apple A5 chipset a speeds up the general operation of the iPhone somewhat, but not as much as Apple would have you believe. Very often, the iPhone 4 is neck and neck with its successor. Here's a comparison video that shows the iPhone 4 and the iPhone 4S launching the same apps, including the camera, and running the same tests side by side:. Of course, there are other software advancements besides Siri, plus services like iCloud, that launch with iOS 5. They aren't exclusive to the iPhone 4S however. For more details on those, check out our iOS 5 review.